Divas of all ages feel "A Lit'l Frazzled by the Holidays" sometimes. 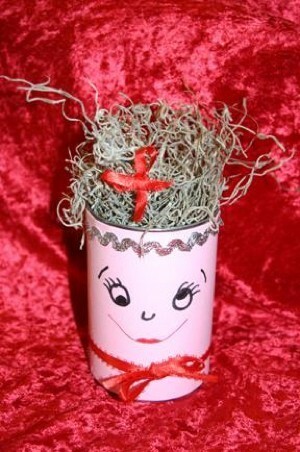 Fill this gift can with lotions, jewlery, or treats to pamper the frazzled lady in your life. These would be cute on the party table of a "A Ladies' Day Out" event. A variation on this theme is included below. Wash can and remove label. (Use smooth edged can like the ones opened with a Pampered Chef opener OR use frozen juice cans for a smaller version). Fold paper in half lengthwise. Attach to can with glue or tape. Draw frazzled face as shown. Add trims to can edges. Fill with gifts or treats and top with moss. Print out a Victorian Image of a woman or girl. Write "Diva's Greetings!" on the photo and cover the can with this. Attach pipe cleaner handle with hot glue. If desired, form pipe cleaner into tiara shape. 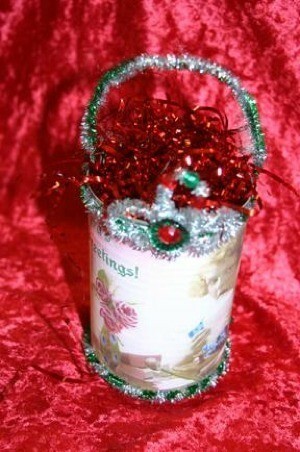 Trim with beads and attach to front of can. Fill with foil or other fancy shreds. Add treats and gifts.